We demonstrated that E2 conjugated to BSA (E2BSA) induces a rapid membrane-initiated inhibition of LH secretion followed hours later by a slight increase in LH secretion. Whether these actions of E2BSA are restricted to the pituitary gland and whether the membrane-initiated pathway of E2BSA contributes to the up-regulation of the number of GnRH receptors during the positive feedback effect of E2 were evaluated here. We have shown that the suppression of LH secretion induced by E2 and E2BSA is the result of a decreased responsiveness of the pituitary gland to GnRH. In this study we further tested the ability of E2BSA to decrease the responsiveness of the pituitary gland to GnRH under the paradigm of the preovulatory surge of LH induced by E2. For the first experiment GnRH and LH secretions were determined in samples of pituitary portal and jugular blood, respectively, in ewes treated with 12 mg E2BSA. In the second experiment, the number of GnRH receptors was quantified in ewes 12 h after administration of 25 micrograms E2 (the expected time for the increase in the number of GnRH receptors and the positive feedback effect of E2 in LH secretion) or 12 mg E2BSA. In the third experiment, the preovulatory-like surge of LH was characterized in ewes injected with 25 micrograms E2 alone or followed 8 h later (before the beginning of the LH surge) with 60 mg E2BSA. 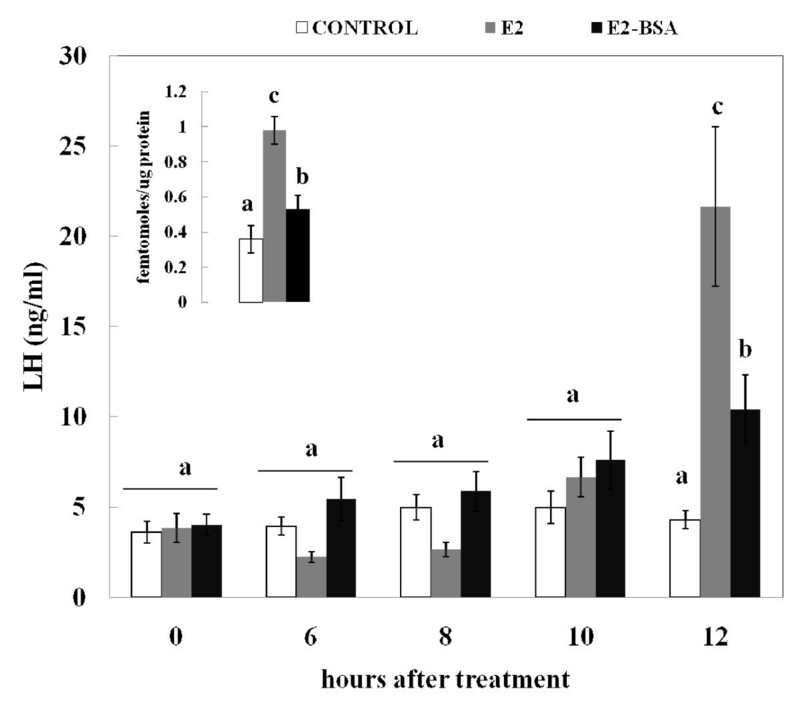 a) the decrease in LH secretion induced by E2BSA was not accompanied by changes in the pulsatile pattern of GnRH, b) E2BSA increased the number of GnRH receptors, and c) the presence of E2BSA in E2-treated ewes delayed the onset, reduced the length, and decreased the amount of LH released during the preovulatory surge of LH. a) the rapid suppression of LH secretion induced by E2BSA is mediated only via a direct action on the pituitary gland, b) E2 acting via a membrane-initiated pathway contributes to increase the number of GnRH receptors and, c) administration of E2BSA near the beginning of the pre-ovulatory surge of LH delays and reduces the magnitude of the surge. The ability of E2 to induce a preovulatory surge of LH [1–5] is the result of actions of E2 on both the pituitary gland and the hypothalamus. In the pituitary gland E2 increases the sensitivity to GnRH by inducing synthesis of GnRH receptors on gonadotropes [6, 7]. In the hypothalamus E2 induces a sustained surge of GnRH [5, 8]; possibly by activating E2-receptive neurons that in turn activate GnRH neurons [9, 10]. Two decades ago, evidence for a short-term negative feedback of E2 on secretion of LH was reported [2, 11]. From studies in a variety of endocrine paradigms it has been shown that both the pituitary gland [2, 12–14] and the hypothalamus mediate the rapid inhibition of LH by E2 [5, 15–18] and that the transition from negative to positive feedback in the pituitary gland is an important component for onset of the preovulatory surge of LH . The ability of E2 to modulate cellular function via novel membrane-initiated (non-genomic) mechanisms [20–23] opens new avenues to study a potential interaction between positive and negative feedback effects of E2 on secretion of LH. E2 conjugated to BSA has been used widely to mimic non-genomic biological responses of E2 in a variety of tissues [24–29]. The rapid biological responses induced by E2BSA are interpreted to be as an action initiated at the cell membrane, acting through specific binding sites that are linked to intracellular signal transduction proteins. We previously demonstrated that either free E2 or E2BSA induced a rapid decrease in secretion of LH in OVX ewes  and in primary cultures of pituitary cells , suggesting a direct action on the pituitary. In the current study, we conducted experiments to examine if membrane-initiated actions of E2-BSA in regulating LH secretion were restricted to the level of the pituitary gland. In the first experiment we tested the hypothesis that E2BSA would rapidly inhibit pulsatile secretion of LH without a corresponding decrease in GnRH release from the hypothalamus. Genomic and non-genomic actions of E2 frequently converge to induce the same cellular response [20–23]. Under this comprehensive model, E2 binds to both nuclear receptors and to putative plasma membrane binding sites. Binding of E2 to nuclear receptors leads to an interaction with estrogen response elements (ERE) in target genes resulting in regulation of gene transcription. In contrast, binding of E2 to membrane binding sites activates specific signal transduction pathways resulting in a more efficient up- or down-regulation of gene transcription. We previously reported that conjugated forms of E2 did not induce a preovulatory-like surge of LH; instead a slight but significant increase in serum concentrations of LH was detected at the expected time of the massive release of LH . Since it is unlikely that a molecule as large as E2BSA crosses the blood-brain barrier to induce a preovulatory-like surge of GnRH, we speculated that the slight increase in secretion of LH is the result of a direct action on the pituitary gland to increase the number of GnRH receptors . In the second experiment of this study, we examined the hypothesis that E2BSA will increase the number of GnRH receptors in OVX ewes. The ability of conjugated E2 to diminish the responsiveness of the pituitary gland to GnRH has been demonstrated in primary cultures of ovine pituitary cells . The third experiment described herein further evaluates the ability of E2BSA to override the massive release of LH induced by a single bolus of free E2. The hypothesis is that E2BSA by acting at the plasma membrane level could diminish the responsiveness of the pituitary gland during the surge of GnRH induced by E2. Free E2 was removed from E2BSA (Steraloids Inc., Newport, RI) by ten consecutive extractions with diethyl ether . 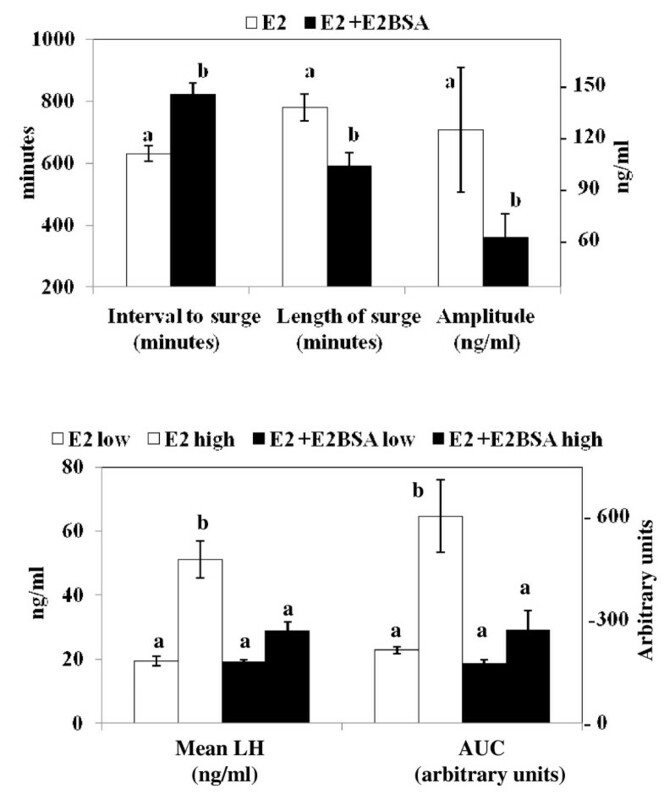 As previously shown , less than 1% of the weight of the conjugate was removed as free E2, and the amount of free E2 remaining in the E2BSA conjugate was substantially less than the concentration needed to elicit a physiological response. D-Ala6-desGlyNH210-GnRH-ethylamide (D-Ala6-GnRH-EA) and E2 were purchased from Sigma (Sigma-Aldrich, Inc., Saint Louis, MO). E2 was freshly dissolved in ethanol the day of treatment and emulsified in mineral oil, whereas E2BSA was dissolved in sterile saline solution. A caveat of using E2BSA as a tool to study non-genomic actions is the potential instability of the conjugate. Our assumption was that if the conjugate breaks down, the resulting free (non-conjugated) E2 should be detectable in serum after organic solvent extraction. 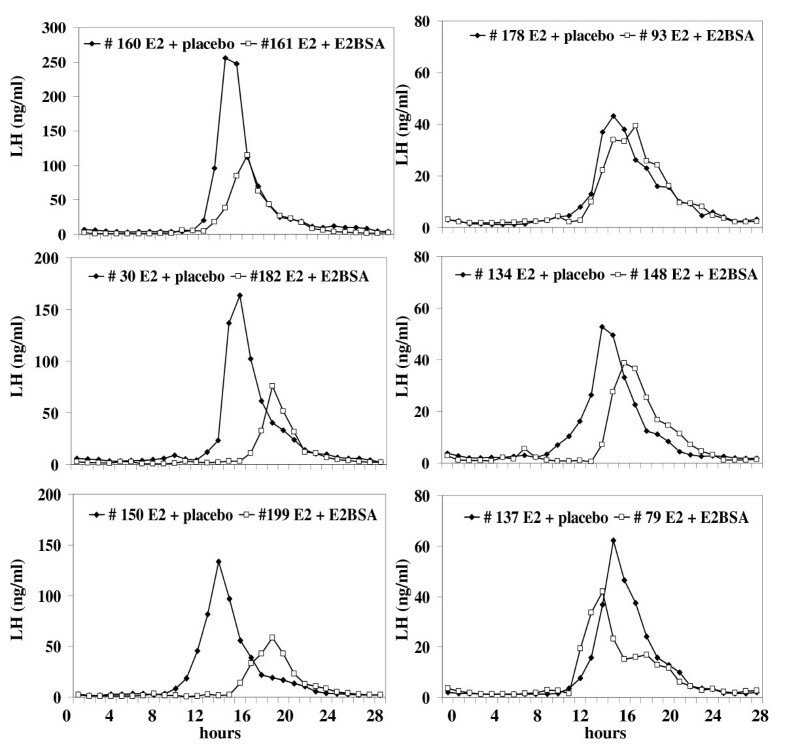 Therefore, to evaluate the ability of E2BSA to remain conjugated in serum, OVX ewes (n = 3) received 174 nmoles E2BSA (based on the molecular weight of BSA) or 92 nmoles of E2 intramuscularly. This dose of E2BSA induces a rapid suppression of LH secretion; followed by a preovulatory-like surge of LH . Blood samples were collected at 0, 1, 2, 6, 10, 16, and 24 h after treatment. Non-conjugated E2 was removed from serum samples by two consecutive extractions with diethyl ether and immunoreactive E2 was quantified by RIA . The intra-assay coefficient of variation was 12% and the assay sensitivity was 0.18 pg/per tube. GnRH receptors were quantified as previously described . The pituitary gland was divided mid-sagitally and half of the anterior pituitary was homogenized (100 mg/ml) in Tris buffer (10 mM Tris, 1 mM CaCl2, and 0.1% [w/v] bovine serum albumin [pH = 7.4]). The homogenate was centrifuged at 30,000 × g for 30 min at 4 C and supernatant was decanted. The top two layers of the pellet were resuspended in 5 ml of Tris buffer and rehomogenized in a Dounce homogenizer. The tissue was centrifuged at 30,000 × g for 30 min at 4 C and the top layer of the pellet was removed and resuspended in 1 ml of Tris buffer. Protein concentration was determined using the BCA protein assay kit (Pierce, Rockford, IL). [125I]-D-Ala6-GnRH-EA was prepared by the glucose oxidase-lactoperoxidase technique . Fifty and 100 μl of crude membrane preparations were incubated with 0.43 nM [125I]-D-Ala6-GnRH-EA in a total volume of 150 μl for 4 h at 4 C. At the end of the incubation, the membranes were diluted with 3 ml of ice-cold Tris buffer and centrifuged for 10 min at 30,000 × g. The supernatants were decanted and the radioactivity remaining in the pellet was quantified. Number of GnRH receptors were quantified using a standard curve technique as described previously . All samples were quantified in one assay and the inter-assay coefficient of variation was 2.8%. Procedures involving animals in experiment 1 were approved by the Committee for the Use and Care of Animals at the University of Michigan whereas procedures in experiments 2 and 3 were approved by the Colorado State University Animal Care and Use Committee and complied with National Institutes of Health (NIH) guidelines. All experiments were carried out between October and January (breeding season) and ewes were ovariectomized (OVX) at least 2 months before treatment. In a preliminary experiment a single im bolus of E2BSA induced a decrease in secretion of LH followed by a slight rise in serum concentrations of LH. Therefore steroids were administered intramuscularly. Mature Suffolk ewes (n = 6) were fitted with an apparatus for collection of pituitary portal blood, according to procedures described previously . After a 2-wk recovery period, ewes were equipped with two indwelling jugular catheters, one for collecting peripheral blood and one for infusing heparin saline (250 U/min). Samples of pituitary portal and jugular blood were collected through a remote automated sampling system that allows continuous collection of samples . Pituitary portal and jugular blood samples were withdrawn continuously and separated into 10-min fractions for analysis of GnRH  and LH  by radioimmunoassay. GnRH quantification was carried out at University of Michigan whereas LH was quantified at Colorado State University. Pituitary portal blood was dispensed into tubes containing ice-cold bacitracin, extracted with methanol (~300 μl plasma) within 1.5 h of sampling and stored at -80 C until analysis of GnRH. After sample collection, ewes were euthanized and the pituitary was inspected for appropriate placement of the lesion in the portal vasculature, to corroborate adequate collection of pituitary portal blood. One ewe (data not shown) was excluded since there was not an obvious lesion on the pituitary gland and GnRH values were exceedingly low and not clearly episodic. For GnRH the intra-assay coefficient of variation was 4.3% and the assay sensitivity was 0.09 pg/tube (3 assays). For LH the intra-assay coefficient of variation was 5% and the assay sensitivity was 30 pg/tube. To evaluate the ability of E2BSA to suppress the pulsatile pattern of GnRH, six ewes received 12 mg E2BSA intramuscularly. Pituitary portal and peripheral blood were separated into 10 min fractions from 4 h before to 4 h after treatment with E2BSA. GnRH and LH pulses were defined as an increase in hormone concentration higher than the mean concentration detected during the 4 h pre-treatment period within an individual followed by at least one descending hormone concentration. GnRH and LH pulse amplitudes were defined as the difference between the peak and its preceding nadir. Because the sampling procedure measures GnRH only in its initial pass through the portal system (GnRH re-circulating from periphery is undetectable) and because many GnRH pulses were split between two consecutive 10-min samples [GnRH pulses last 5-6 min ], the amplitude of a given GnRH pulse was calculated by adding all values greater than baseline and subtracting the value of the preceding nadir. GnRH in pituitary portal blood was calculated as a collection rate (pg per minute) rather than concentration. This minimizes error due to changes in rate of portal blood withdrawal caused by changes in head position or contamination of portal blood with CSF (cerebrospinal fluid) or peripheral blood. The latter was judged to be minimal based on little or no blood aspirated into the sampling lines during the hour prior to lesion of the portal vessels; CSF contamination was negligible based on hourly hematocrit measures during sampling. Mature Western-range ewes were fitted with a jugular cannula to withdraw blood samples. To determine if an increase in the number of GnRH receptors was associated with the increase in LH induced by E2BSA, ewes (n = 6) received 92 nmoles E2 (in 3 ml of safflower oil) or 174 nmoles E2BSA (in 3 ml saline solution). Sham injections of saline solution or safflower oil were administrated to E2- and E2BSA-treated ewes, respectively. This dose of E2BSA induces a slight but significant increase in serum concentrations of LH at the expected time of the massive release of LH [30, 38]. Blood samples were collected before administration of estrogenic compounds and every 2 h from 6 to 12 h after treatment. To minimize the effect of GnRH released during a preovulatory-like surge of LH on the number of GnRH receptors, pituitary glands were collected at the beginning of the time of the expected surge of LH (12 h after treatment). This interval proved to be sufficient to induce the highest number of GnRH receptors in primary cultures of ovine pituitary cells incubated with E2 or E2BSA . Concentrations of LH were determined in one assay. The intra-assay coefficient of variation was 5% and the assay sensitivity was 36 pg/tube. The objective was to test the hypothesis that E2BSA is able to disrupt the preovulatory-like surge of LH induced by E2. Disruption of the preovulatory-like surge of LH would open a new avenue to study conjugated forms of E2 as a potential method of contraception that might be more specific than the current steroidal contraceptives. We have demonstrated that conjugated E2 is able to reduce GnRH-induced release of LH in primary cultures of ovine pituitary cells  and to suppress pulsatile secretion of LH in OVX ewes for at least 10 h under basal secretion of GnRH . We speculated that E2BSA, by acting at the plasma membrane level, could diminish the responsiveness of the pituitary gland to the surge of GnRH induced by E2. We presumed that, in order to overcome the stimulatory effect of the massive release of GnRH, a higher dose of E2BSA would be necessary. Thus, we administered E2BSA to a dose ~10 times higher than E2 (based on molecular weight of BSA). Due to the variability in the magnitude of LH surge induced by E2, in a preliminary study the magnitude of the LH surge was determined in mature Western-range ewes. Animals were ranked based on the mean LH during the surge and then assigned to either a high or a low E2-responsive group (n = 6 per group). At least one month later, ewes (n = 12) ranked within each E2-responsive group were alternately assigned to received an im injection of 92 nmoles E2 at time zero. Six of these ewes received an im injection of 870 nmoles E2BSA (in 3 ml saline solution) or saline solution 8 h after injection of E2. Blood samples were collected every hour from 4 h before to 28 h after treatment and LH was quantified. Intra- and inter-assay (10 assays) coefficients of variation for LH were 5 and 10%, respectively. The assay sensitivity was 32 pg/tube. The effect of E2 alone or together with E2BSA on the preovulatory-like surge of LH was evaluated using five parameters: 1) Mean LH, 2) Amplitude; defined as the highest concentration of LH, 3) Area under the curve during the surge of LH (AUC), 4) Length of the preovulatory-like surge, defined as the period between the onset and the end of the LH surge, and 5) Interval from administration of E2 to the onset of the massive release of LH. A preovulatory-like surge of LH was described as a concentration of LH equal to or higher than the pre-treatment mean LH plus 2 standard deviations detected within an individual (surge onset), followed by increasing concentrations of LH reaching an amplitude of at least 40 ng/ml, and remaining over onset concentration for at least 6 h. The end of a surge of LH was described as a descending concentration of LH, equal to or lower than the pre-treatment mean LH plus 2 standard deviations detected within an individual. A preovulatory-like surge of LH was defined as the period during which an increasing concentration of LH equal to or higher than the pre-treatment mean LH plus 2 standard deviations first is detected within an individual, reaching amplitude of at least 40 ng/ml, and remaining over onset concentration for at least 6 h. The end of a surge of LH was defined as a descending concentration of LH that no longer met the criteria for a surge. Data were subjected to analysis of variance (ANOVA) using the general linear model of SAS . Serum concentrations of LH (experiments 1 and 2) and E2, as well as GnRH collection rate (experiment 1) were evaluated by repeated measures analysis. Number of pulses of GnRH and LH were subjected to arcsine transformation. Changes in the number of GnRH receptors were analyzed in a completely randomized design. Variables related to the preovulatory-like surge of LH (experiment 3) were analyzed in a completely randomized design with a factorial arrangement. The factors included in the analysis were treatment, level of responsiveness to E2 (high and low) and their interaction. When differences among treatment means were detected, they were separated using the Least Significant Difference (LSD) procedure. If variances were not homogeneous, data were Log10 transformed. 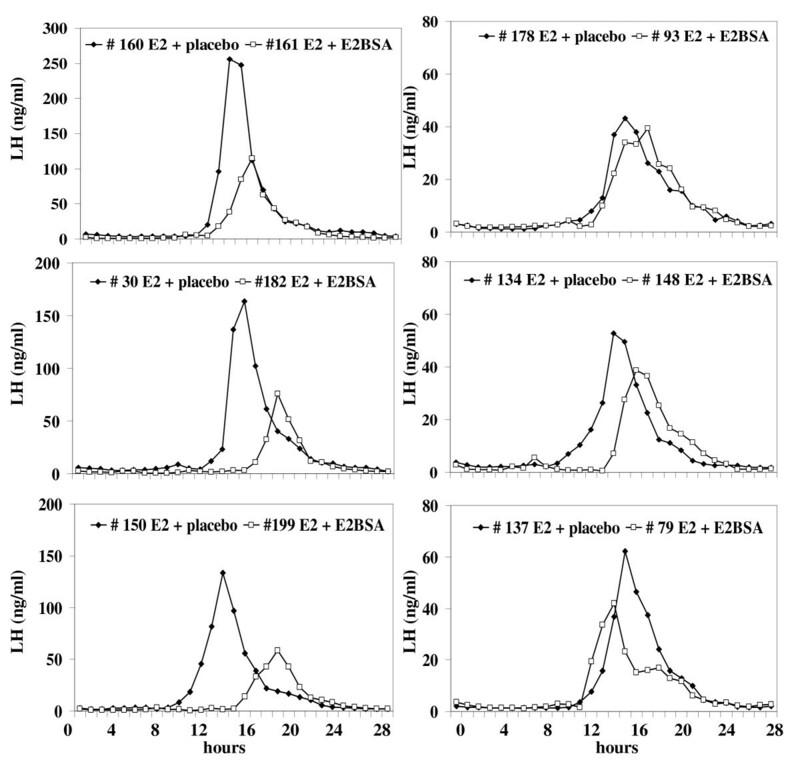 To demonstrate the stability of E2BSA in serum, ewes received an im injection of either E2 (92 nmoles) or E2BSA (174 nmoles) and free, unconjugated E2 was quantified. In E2-treated ewes serum concentrations of E2 reached a peak (P < 0.01; 206 ± 15 pg/ml) 1 h after administration, remained above baseline for at least 16 h and then returned to pre-treatment concentration (1.0 ± 0.3 pg/ml). Conversely, in E2BSA-treated ewes there was no change in serum concentrations of immunoreactive E2 and it remained similar to pre-treatment levels during the period evaluated (0.7 ± 0.3 vs. 1.0 ± 0.3 pg/ml). GnRH and LH profiles of individual ewes treated with E2BSA are depicted in Figure 1a. Prior to treatment, GnRH and LH pulses were readily detected in all ewes. In 4 of 5 ewes, LH pulses were less evident after administration of E2BSA. In the remaining ewe (# 3), LH decreased steadily during the post-E2BSA period. Compared to pre-treatment period (Figure 1b), E2BSA decreased mean plasma concentrations of LH (P < 0.02) and the number of pulses of LH (P < 0.01); however, no changes were detected in the amplitude of pulses of LH. In contrast to LH, E2BSA did not alter the mean collection rate of GnRH, the number of pulses of GnRH, or the amplitude of pulses of GnRH (Figures 1a and 1b). Effect of E 2 BSA on the secretory patterns of LH and GnRH. 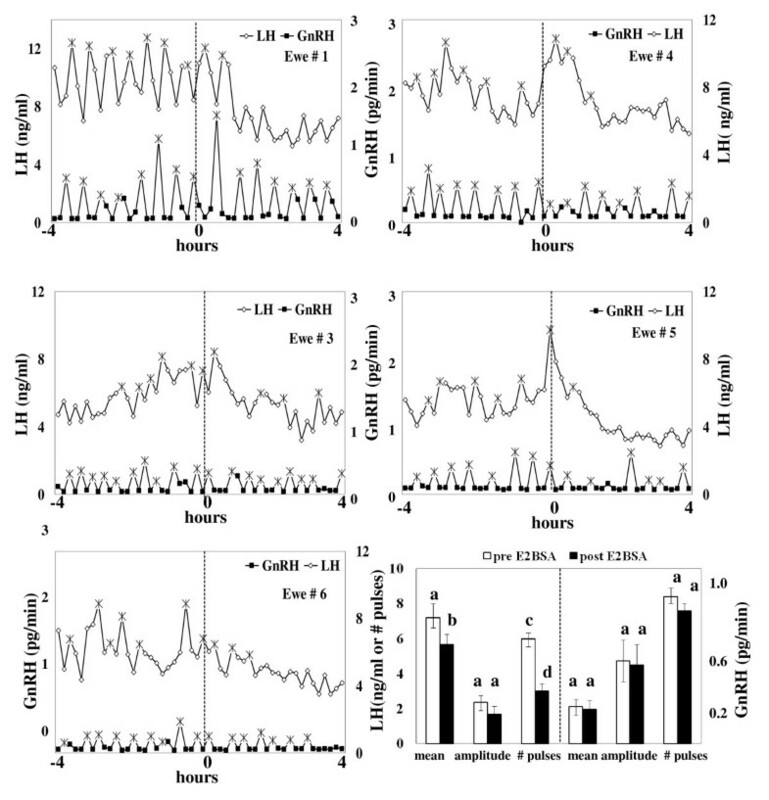 (a) Secretory patterns of LH and GnRH in individual ewes during the acute inhibition of LH induced by E2BSA. Patterns of LH (open diamonds) and GnRH (closed squares) in individual ewes treated with an im bolus of 12 mg E2BSA (hour 0). GnRH and LH were measured in samples of pituitary portal and jugular blood, respectively, withdrawn continuously and separated into 10-min fractions, from 4 h before to 4 h after treatment. (*) is indicative of a pulse. (b) E2BSA decreased secretion of LH without affecting the secretory patterns of GnRH during the acute inhibition of LH secretion. Mean plasma rate of GnRH, number of pulses of GnRH and amplitude of pulses (right panel) were measured in pituitary portal blood whereas mean LH, number of pulses and amplitude of pulses of LH (left panel) were measured in jugular blood. Samples were collected at 10-min intervals, from 4 h before (open bars) to 4 h after treatment (solid bars). Data are presented as the mean ± SEM. Comparisons were made within periods. a, b differ (P < 0.02); c, d differ (P < 0.01). Twelve hours after treatment with E2 or E2BSA the number of GnRH receptors increased (P < 0.05) compared to controls (Figure 2 insert). The increase was higher (P < 0.05) in E2-treated ewes compared to ewes treated with E2BSA (Figure 2 insert). Before treatments, serum concentrations of LH were similar among groups (Figure 2). Twelve hours after administration of the estrogenic compounds, serum concentrations of LH were elevated (P < 0.05) in E2- and E2BSA-treated ewes and were higher (P < 0.01) in ewes treated with E2 than in ewes treated with E2BSA (Figure 2). E 2 and E 2 BSA increased the number of GnRH receptors and LH secretion at the expected time for the beginning of the preovulatory-like surge of LH. Effect of Ewes (n = 6) received an im injection of saline solution (control), E2, or E2BSA at time zero. Mean serum LH was measured at 0, 6, 8, 10, and 12 h after treatments. Comparisons were made within and among treatments. a, b differ (P < 0.05), c differs from a/b (P < 0.01). Insert depicts changes in the number of GnRH receptors in ovine pituitary glands from ewes 12 h after administration of treatments. Bars with unlike subscripts differ (P < 0.05). Data are presented as the mean ± SEM. Figure 3 depicts individual LH profiles during the preovulatory-like surge of LH in OVX ewes treated with E2 alone and E2 followed 8 h later by E2BSA or saline solution. The panels on the left depict the LH profiles of ewes previously classified as highly responsive to E2. The panels on the right depict the LH profiles of ewes previously classified as less responsive to E2. All ewes treated with E2 expressed a surge of LH, starting approximately 12.1 h (725 ± 34 min) after injection of E2 with an average length of 11.4 h (685 ± 49 min; Figures 3 and 4a). Intramuscular injection of 60 mg E2BSA in ewes pre-treated with E2 delayed (P < 0.05; Figure 4a) the onset of the preovulatory-like surge of LH and decreased (P < 0.05; Figure 4a) the length and amplitude of the surge of LH regardless the level of responsiveness to E2; E2BSA decreased mean serum concentrations of LH and the AUC (i.e. the total amount of LH released) only in ewes classified as highly responsive to E2 (P < 0.05; Figure 4b). Secretory pattern of LH in individual ewes showing the effect of a high dose of E 2 BSA on the preovulatory-like surge of LH induced by E 2 . In a preliminary study the magnitude of the LH surge in response to E2 was determined; ewes were ranked based in the mean LH during the surge induced by E2, then assigned to either a high (LH profiles in the left panel) or a low (LH profiles in the right panel) E2-responsive group (n = 6 per group). Approximately one month later, ewes (n = 12) were given an im injection of 25 μg E2 and then assigned alternatively within each responsive group, to receive an im injection of 60 mg E2BSA (open squares) 8 h after injection of E2 or saline solution (placebo; closed diamonds). The negative impact to E2BSA on the massive release of LH induced by E2 was more pronounced in ewes classified as highly responsive to E2. Effect of E 2 BSA on the preovulatory-like surge of LH induced by E 2 . Ewes received an im injection of 60 mg E2BSA 8 h after injection of E2 or saline solution (placebo). Data are presented as the mean ± SEM. Unlike subscripts differ (P < 0.05). (a) E2BSA delayed the interval to the surge, reduced the length of the surge, and decreased the amplitude of the surge induced by E2, regardless the magnitude of the response to E2. (b) E2BSA decreased the mean LH and the AUC (area under the curve of LH) induced by E2, but only in ewes classified as highly responsive to E2. We demonstrated previously that equimolar concentrations of free E2 or E2 conjugated to BSA suppressed the GnRH-induced release of LH in cultures of ovine pituitary cells  suggesting a direct action on the pituitary gland. In OVX ewes, a similar decrease in LH secretion was recapitulated by administration of E2 or E2BSA at equimolar concentrations . In this study we tested the possibility that the decrease in LH secretion induced by E2BSA could (at least partially) be mediated by an action at the level of the hypothalamus. We found that the decrease in LH pulse frequency and mean LH induced by E2BSA was not accompanied by changes in either pulse frequency or pulse amplitude of GnRH. Therefore, the actions of E2BSA on LH secretion seem to occur only at the level of the pituitary gland, presumably by decreasing responsiveness to GnRH. Together with our previous reports [13, 30], these data suggest that pharmacological targeting of the pituitary gland with E2BSA is sufficient to mimic the rapid inhibitory action of E2 on LH secretion. It is worth mentioning that we did not detect a decrease in the pulse amplitude of LH. It is possible that our criterion to detect pulses did not identify small increases in LH concentrations as pulses, or that our sampling was too infrequent to detect a marginal decrease in pulse amplitude. The exclusion of these "low amplitude pulses" may have masked an effect on the amplitude of LH pulses. Nevertheless, since E2BSA did not decrease either pulse frequency or pulse amplitude of GnRH, the effect of E2BSA on LH secretion is attributed to a direct action on the pituitary gland. The apparent lack of effect of E2BSA on the secretory pattern of GnRH provides evidence that E2BSA does not have a hypothalamic effect, possibly because it does not cross the blood-brain barrier. In a recent study  evidence was provided for the mechanism underlying the rapid inhibitory effect of E2 on the GnRH-induced release of LH secretion in primary cultures of ovine pituitary cells. In that study, the increase in cytoplasmic intracellular free calcium concentration ([Ca++]i) mediating the GnRH-induced release of LH secretion was abolished by 2 min pretreatment with E2 or E2BSA, which agrees with the time frame for the beginning of the rapid decrease of LH secretion induced by estrogens. In hypothalamus-pituitary-disconnected ewes, E2 increased the number of gonadotropes expressing phosphorylated extracellular signal-regulated-kinases 1 and 2 (pERK-1/2), c-AMP-responsive element-binding protein (pCREB), and serine 473 kinase (pAkt) within 15 to 90 minutes after administration of E2 . Whether these and/or other upstream signaling molecules contribute to maintain a decreased responsiveness of the pituitary gland to GnRH (for at least 10 h in our previous study ) after administration of estrogens is yet to be evaluated. A caveat of using E2BSA as a tool to study non-genomic actions is the stability of the conjugate, particularly if the conjugate is used in studies in vivo. We demonstrated  that conjugated forms of E2 mimicked the acute non-genomic action of E2 (i.e. rapid decrease of LH secretion), but not the more prolonged, presumably genomic actions (i.e. preovulatory-like surge of LH and decrease in FSH secretion). These data strongly support the conclusion that there is insufficient free E2 (i.e. enough to mimic the genomic actions) in the conjugate to have a biological effect. In the current study we provided further evidence on the stability of E2BSA in blood. It is known that E2 can rapidly regulate secretion of GnRH [8, 16, 18, 43, 44]. Consequently, the fact that E2BSA did not change the secretory pattern of GnRH strengthens our previous conclusion of the absence of sufficient free E2 to induce a physiological response. Furthermore, administration of E2BSA to OVX ewes did not raise serum concentrations of free E2 over pre-treatment levels during the 24 hours evaluated. Therefore, the actions of E2BSA can only be attributed to the conjugated form of E2. In a previous report , we showed that infusion of E2BSA to OVX ewes did not induce a typical preovulatory-like surge of LH; instead a slight but significant increase in serum concentrations of LH was detected at the time of the expected massive release of LH. The possibility that the slight increase in LH secretion induced by E2BSA was the result of an increase in the number of GnRH receptors was evaluated in this study. Indeed, administration of E2BSA to OVX ewes increased the number of GnRH receptors in the pituitary gland and it was associated with a slight rise in serum concentrations of LH at the expected time for the beginning of the preovulatory-like surge of LH (12 h after administration of conjugated E2). This report provides the first in vivo evidence in ewes of a membrane-initiated pathway as a component of the mechanisms underlying the synthesis of GnRH receptors induced by E2. It seems that the non-genomic actions of E2 in the pituitary gland are not restricted to the rapid suppression of pulses of LH reported elsewhere . The ability of E2BSA to induce both a suppression in responsiveness of the pituitary gland to GnRH and an increase in the number of GnRH receptors is compatible since E2 up-regulates the number of GnRH receptors subsequent to the short-term negative feedback [2, 6, 45, 46] and the sum of these two events may be part of the strategy to ensure a buildup of pituitary content of LH for a robust preovulatory surge. Since an ERE is not involved in mediating the actions of E2BSA [24, 27, 47, 48] and a canonical ERE has not been reported in the GnRH receptor gene [47–50], we speculate that a membrane-initiated pathway may activate down-stream events facilitating the transcription of GnRH receptors, as well as inhibiting GnRH-induced secretion of LH. As mentioned above, an increase in phosphorylation level of a number of proteins in the gonadotropes has been reported 15 to 90 minutes after administration of E2 . The ability of E2 or E2BSA to increase the level of protein phosphorylation for longer periods would be compatible with our speculation on a membrane-initiated pathway as a component in the synthesis of GnRH receptors number, as well as maintaining the inhibition of LH secretion after the initial decrease. The ability of E2 and E2BSA to activate upstream signaling molecules for longer intervals has yet to be evaluated. The ability of E2BSA to inhibit responsiveness of primary cultures of ovine pituitary cells to GnRH  was the basis for examining its ability to abolish the E2-induced massive release of LH in ewes. Based on our previous in vivo study  E2BSA would decrease responsiveness of the pituitary gland to GnRH within the first hour after E2BSA, and it remained decreased for at least 10 h under basal secretion of GnRH. In the current experiment we overlap the period of a decreased responsiveness of the pituitary gland to GnRH to the expected time for the surge of LH by administering E2BSA 8 h after E2 (2-3 h before the beginning of the preovulatory-like surge of LH) at a dose 10 times higher than previously reported . Under these experimental conditions, E2BSA failed to obliterate completely the E2-induced massive release of LH. Nevertheless, E2BSA decreased the magnitude of the preovulatory surge of LH induced by E2, not only delaying the onset of the surge of LH, but also resulting in an early termination of the preovulatory-like surge of LH, and to some extent reducing the amount of LH released. It is not clear why the decrease in the amount of LH released by E2BSA was more apparent in ewes highly responsive to E2 than in ewes with a lower responsiveness to E2. If as proposed, E2BSA is reducing responsiveness of the pituitary gland to GnRH, it is more likely that E2BSA could override the GnRH input during the beginning and the end of the surge of LH, when secretion of GnRH is not at the maximum concentration [1, 4, 8, 16, 17, 19]. Notwithstanding the expected increase in the number of GnRH receptors, the net effect of E2BSA was a reduction in the magnitude of the preovulatory-like surge of LH. This implies a predominant role of the membrane-initiated actions of E2 in the mediation of the negative feedback effect on LH secretion compared with a minor contribution, by itself, on the synthesis of GnRH receptor. This interpretation is consistent with the slight increase in the number of GnRH receptors induced by E2BSA, compared with that induced by E2, and agrees with other experimental paradigms where equimolar doses of conjugated or un-conjugated E2 induced a similar decrease in LH secretion in ewes,  and in primary cultures of ovine pituitary cells ; whereas in the same cells, higher doses of E2BSA were required to increase the number of GnRH receptors . Although regulation of synthesis and/or secretion of GnRH by E2BSA were not evaluated during the expected time of the preovulatory-like surge of LH, we do not think that the effects were mediated via the hypothalamus. In support of this notion: a) E2BSA did not modulate the pulsatile profile of GnRH (at least for the first 4 h after administration), b) conjugated E2 was stable in blood (at least for 24 h), and c) administration of a high dose of E2BSA just before the preovulatory-like surge of LH induced by E2 decreased the amount of LH released. Therefore we suggest that the actions of E2BSA on LH secretion are the result of a direct action on the pituitary gland. The rapid suppression of LH secretion induced by E2BSA is mediated only via a direct action on the pituitary gland. E2 acting via a membrane-initiated pathway contributes to the E2-induced increase in the number of GnRH receptors. Administration of E2BSA near the beginning of the pre-ovulatory LH surge delays and reduces the magnitude of the surge. This project was supported by National Research Initiative Competitive Grant no. 2005-35203- 15376 from the USDA Cooperative State Research, Education, and Extension Service (TMN) and by NIH-HD grant 30773 (FJK). All authors contributed to the design of the study and revised critically the manuscript. RLA acquisition of data for experiments 2 and 3. AEO, and FJK acquisition of data for experiment 1 and data interpretation, ERW acquisition of data for experiment 1, data interpretation, and radioimmuno assays for GnRH. TMN acquisition of data for experiments 2 and 3 and data interpretation. JAAA acquisition of data for experiments 1, 2, and 3, data interpretation, radioimmuno assays for LH and E2, quantification of GnRH receptors, data analysis, and drafted the manuscript. All authors read and approved the manuscript.